NORWALK, Conn. — Readers and local leaders will fete the poetry they love on Tuesday at the Norwalk LitCrawl, a tribute to spoken literature. The annual event is a local “celebration of the written word,” organizer and Norwalk Public Library director Christine Bradley said. Brian Griffin, President of the Norwalk Chamber of Commerce and one of the event’s organizers, appreciates the insights the LitCrawl can offer into Norwalk’s elected officials. “You might see them as ‘oh, they’re the common councilmember,’” Griffin said. “But you get more insight into who they are as a person,” from their selections, he said. Mayor Harry Rilling, who has attended all six LitCrawls, will open the evening at 5:30 at the Wall Street Theater, followed by readings there. Literature lovers will then “crawl” to Fat Cat Pie Co. where readings will start at 7 p.m.
“It is not the critic who counts; not the man who points out how the strong man stumbles, or where the doer of deeds could have done them better. The credit belongs to the man who is actually in the arena, whose face is marred by dust and sweat and blood,” his reading began. This year Norwalk Tax Collector Lisa Biagiarelli will read “The Summer Day” by Mary Oliver, Superintendent of Schools Dr. Steven Adamowski will read “Invictus” by William Henley, and Jon Dyer will read “Annabel Lee” by Edgar Allen Poe. Other Norwalk notables set to read include Town Clerk Richard McQuaid, Norwalk Poet Laureate Laurel Peterson, her husband, Van Hartmann, a poet and professor of English at Manhattanville College, and Marge Costa, Executive Director of the Norwalk Education Foundation. Griffin isn’t sure what he’ll read — possibly something by Bob Dylan, whose lyrics he considers poetry. State Senate Majority Leader Bob Duff (D-25) may also read, Bradley said. 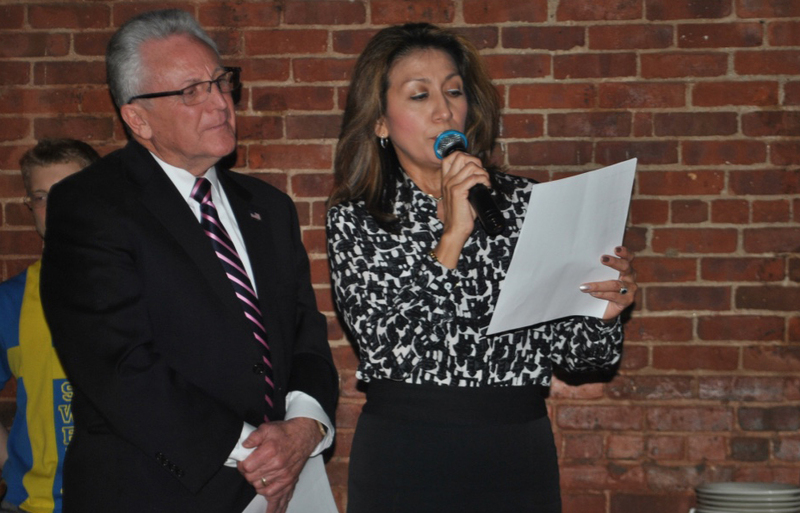 Rilling will announce Norwalk’s new Poet Laureate. The roster of Wall Street-area venues has been reduced to two locations, from four last year. Organizers including Griffin and Bradley hope the switch will promote a greater feeling of camaraderie among attendees. “It should be a bigger group” at the two venues, and a more cohesive event, compared to prior years, Bradley said. Despite the changes, the LitCrawl remains a pillar of continuity in Norwalk. The event’s spirit is infectious; many people who come as guests of other attendees decide they want to stand at the podium themselves next time, or return to listen year after year, Bradley said. April is poetry month, which is coincidental but appropriate, she noted. Principals of the two venues also take an active role: Suzanne Cahill, President of the Wall Street Theater, welcomed participants with open arms last year, and Suzanne and Anthony Ancona of Fat Cat Pie Co. “always put out a lot of pies,” Bradley said. 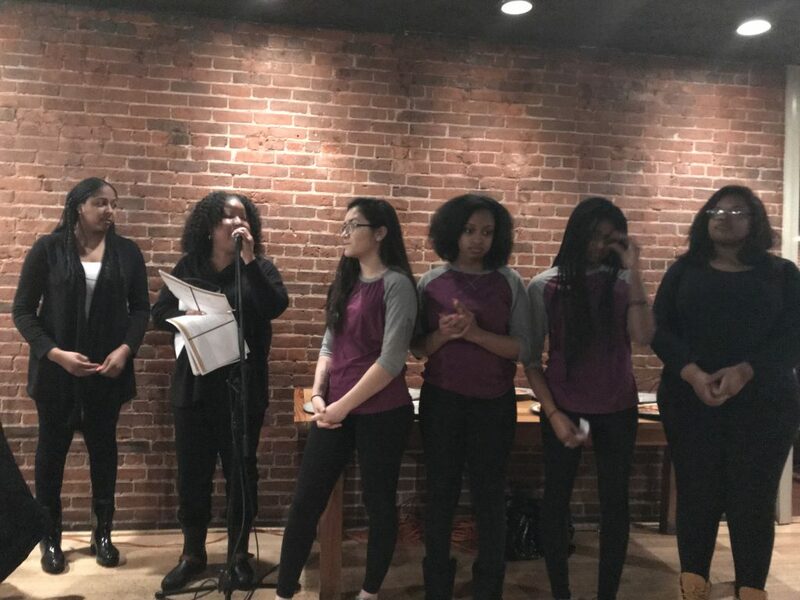 Last year for the first time a group of five students from the young women’s mentoring organization YL Trapped read a poem together at Fat Cat Pie Co. Harris said some youth will participate again this year. Proceeds from the event will benefit the children’s literacy organization Norwalk Reads. Tickets can be purchased by making a $10 contribution to Norwalk Reads on the Norwalk Public Library website. LitCrawl 2019 starts Tuesday, April 9 at the Wall Street Theater at 5:30 p.m. and moves to Fat Cat Pie Co. at 7 p.m. Free appetizers will be provided by the restaurant, along with a cash bar. NancyOnNorwalk is a media sponsor of the 2019 Norwalk LitCrawl. Don’t miss this awesome Tuesday evening in our community, all for a good cause! See you Tuesday at 5:30! I’ll be reading short selections from Mary Oliver, lesbian poet and Provincetown resident who just passed earlier this year. Looks like at least one other reader has also chosen Oliver to read. Good choice!